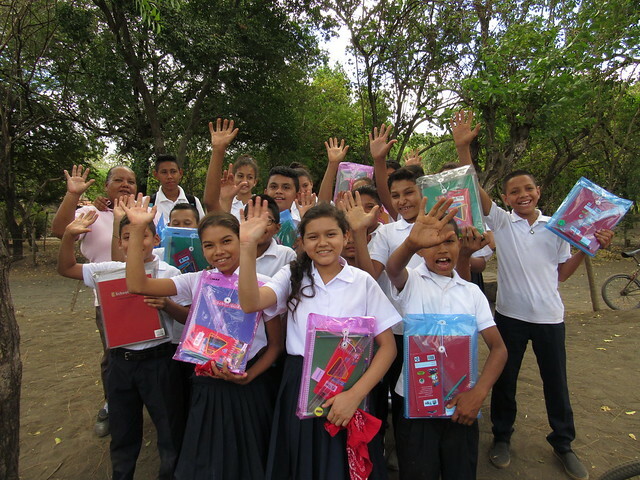 SchoolBOX supports over 18,000 children and teachers in 100+ Nicaraguan communities with school supplies each year. In Nicaragua many children don’t attend school for lack of the most basic of supplies. A notebook can literally stand in the way of a child receiving or not receiving a basic education. As the poorest country in the America’s, many of its citizens are forced to forgo educational expenses in order to simply survive. When we started working in Nicaragua over a decade ago, only 48% of children were able to complete elementary school once enrolled (UNESCO, 2007). Now 56% of students finish elementary school (UNICEF 2012). Things can change! SchoolBOX provides an educational package with sufficient materials (notebooks, pencils, eraser, pencil sharpener, ruler, coloured pencils, and modelling clay) for a student to study for an entire school year. Our organization gives each INDIVIDUAL student in our partner schools an educational package, which ensures that the supplies are distributed in the most equitable and transparent means possible. It is simple, cost effective and it works! The impact on the children who receive the packages is dramatic. In 2018, we ran a pilot program to equip children in our partner schools with backpacks to transport their supplies to school. The kids loved their new backpacks and they were a hit with their parents as well. We have decided to distribute backpacks to student once every 3 years as part of our educational packages.